If you’re building wealth through your business, you have to start early. Insured Retirement Plans are not a get-rich-quick phenomena but instead a steady, consistent and guaranteed return over time. When you factor in the tax favourable way you can get money out of your business, you are looking at steady year-over-year double digit rate of return growth. This is an excellent method of building wealth in your business. The real power is what this IRP vehicle can do over time. Consider two business owners: one is 30-years old and one is 50-years old and both are starting an Insured Retirement Plan. They contribute after business tax dollars into a Permanent Life insurance policy. Both contribute for 20 years and then the policy is considered paid-in-full. They both take out a $1 million dollar policy, contribute the maximum amounts as well as take advantage of the Extra Deposit Options available to them through the insurance carrier. As you can see, the 30-year business owner contributed about 60% less premiums compared to that of the 50-year old business owner, yet the Cash Value and Death Benefit is twice that of the 50-year old when they are both 70 years old. 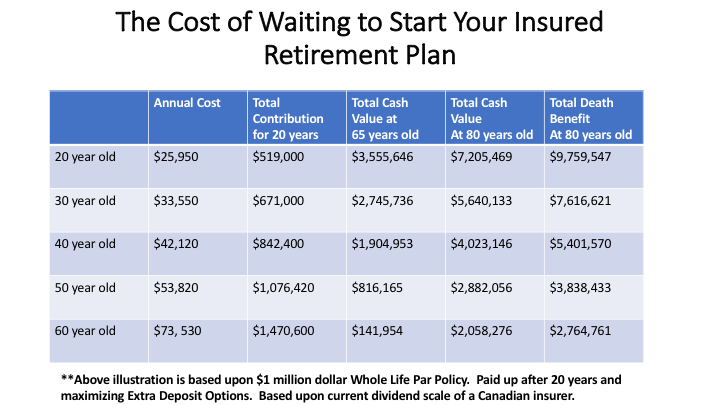 The two biggest factors in the difference; the net cost of pure insurance between the two and the extra time that the 30-year business owner has dedicated building wealth. Both types of policies are excellent ways to dividend out profits and pay a much higher personal marginal tax rate. However, time is the most important factor that affects how significantly the cash value of the policy grows.